The BLM rendition of Tulare Lake shows the area to the north and east of Tulare Lake body as water entered the Lake (light blue area). For thousands of years the High Sierra rivers and streams ran free like the wind, eventually emptying into the San Joaquin Valley, unchallenged by any diversion or man-made structure. Upon seeing the magnificent Kings River in 1776 Spanish Captain Jose Joaquin Moraga reveled at the sight. Thirty years later, in 1806, Captain Moraga’s son Gabriel, christened it “Rio de Los Santos Reyes” or River of the Holy Kings. Both Jose and Gabriel were prominent Spanish army officers during the exploration and occupation of Alta California. Little did they realize that California would slip from Spain’s rule to Mexico’s and then just a short 44 years later California would become the 31st State. This once impressive river gathered its majestic force from annual sierra snow melts, often exploding its channel for miles as it rushed unencumbered into the San Joaquin Valley. These substantial flows of water filled what was once referred to as the largest body of fresh water west of the Mississippi River - and it was referred to as Tulare Lake. It was named by the Spanish after seeing the massive native groves of tule that lined the Tulare Lake shoreline. 1866 BLM map of Tulare Lake above the 200-foot level, but not actively discharging into Summit Lake and the Fresno Slough. How big was Tulare Lake? In wet years it could stretch over 690 square miles across the Central Valley. At times, towns like Corcoran and Stratford, had they existed then, would have been submerged beneath 25 feet of the Sierra’s water, and its shore would reach to the outskirts of Lemoore. Such was the size and scope of the vast Tulare Lake well over 150 years ago. 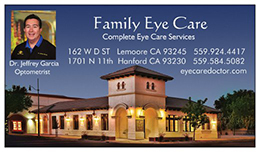 The Tulare Lake region was the first home of the local Native Americans of the Central Valley. In Lemoore’s Downtown Plaza Park, a colorful mural adorns the local Bank of America east wall, depicting what life might have been like for the lake’s first residents. The mural depicts the “tules” which would grow to 10 feet in length and how Tachi Tribe members would utilize this natural recourse. But, despite high periods of runoff, Tulare Lake has been mostly dry for the past 100 years. Dry because of years of diversion by irrigation districts starting in the 1860s and then the construction of dams, levees and canals that controlled the flow of the mighty Kings. Before Pine Flat Dam was built fierce rainstorms nearly filled Tulare Lake in 1938, and in 1983 the wet year managed to fill much of the old lake as it reached the outskirts of Corcoran. According to geographical records, the area known as the “Tulare Lake Region” formed millions of years ago as geological events created a great basin between the Sierras to the east and the Coastal Range to the west. The last discharge into the San Joaquin River was in 1878. The depiction in 1879 shows the start of many years of decline in the Lake’s volume. The Kings River supplied most of the water to the basin. 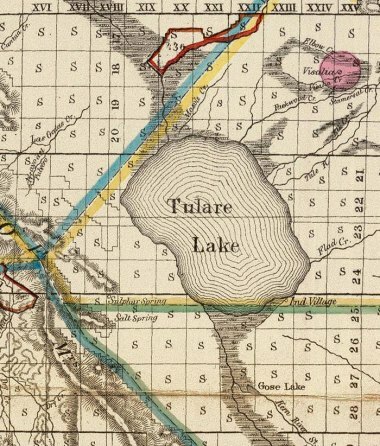 In wet years, and prior to 1878, Tulare Lake might cover an area as large as 30 townships or 1,080 square miles. When full, the waters would flow northward into Summit Lake (south/west of Riverdale), into the Fresno Slough and then to the San Joaquin River all the way to the Delta. On the south end of the San Joaquin Valley excess runoff from the Kern and Buena Vista Lakes would flow north into the Buena Vista Slough through a natural sand ridge into Tulare Lake. Often called “Two Tulare Lakes,” during high runoff years a lake would form south of the Sand Ridge. 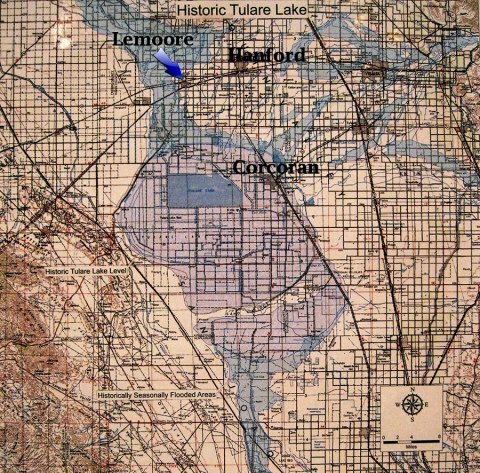 The illustration “Historic Tulare Lake” from the BLM files clearly shows the second Lake to the south of Tulare Lake. The first inhabitants were Native Americans who settled in the Tulare Lake Basin three or four thousand years ago, because of Tulare Lake, were provided a bountiful supply of wild life and plants to sustain its inhabitants. The valley division of Yokuts, which ranged from the Tejon Pass on the South to Stockton on the north, was divided into 23 distinctive tribes. 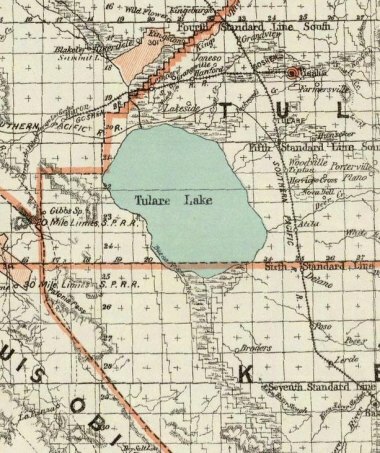 Ancestors of the local Tachi Tribe members lived on the north west side of Tulare Lake and as far west as Huron and Coalinga. Once outsiders wandered into the Central Valley area that would all change. Interesting statistics about the varying size of the Tulare Lake fills the files at the Bureau of Land Management’s office in Bakersfield and publications by other researchers. I have tried to summarize most of the technical information in hopes of providing a picture of what Tulare Lake may have looked like between1850 and 1880 for this article. By taking a look at the system designed to judge the size and depth of the lake we can understand the significance and natural attributes of this very large body of water. The measurement system is based on the fact that the lake floor is 179 feet above sea level. This means that a water surface level of 220 feet above sea level made the depth of the lake, at its deepest point 41 feet and a lake surface of 207 feet would mean a depth of 28 feet. When looking at outflow a lake surface of 220 feet created an outflow of 13 feet into Summit Lake which had an entrance of 207 feet above sea level. From Summit Lake the water would flow into the “Fresno Slough” then the San Joaquin River, eventually all the way to the Delta. According to records compiled by historian Frank Latta, Tulare Lake was above the magic discharge number of 207 feet flowing into the San Joaquin River in 1844; from 1850 to 1851; from 1852 to 1855; from 1862 to 1865, and again between1868 to 1877. The 200-foot level has not been attained since 1880 and the last outflow in to the San Joaquin River was in 1878. What do all these figures actually mean? Well, at Tulare Lake’s highest surface elevation of 225 feet (a lake depth of 46 feet) reported in 1852, Stratford and Corcoran would be 25 feet under water. Waukena would be submerged one foot and the shoreline would be five miles from Pixley and Earlimart, five miles south of Hanford, and three miles south of Armona. 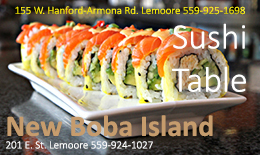 For us, the edge of the Lake would be at the western edge of the old city of Lemoore. 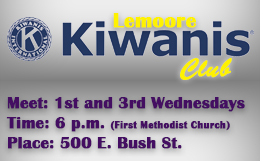 The closeness to Lemoore was due to the overflow of the river’s banks as water rushed into the lake and again when the lake pushed northward in to Summit Lake and then on to the Delta. Due to the diversion of irrigation water that gradually reduced the Lake’s size, there has been no Lake overflow into the San Joaquin River since 1878. But, because of intentional diversions of the Kings River there have been times when water from the Kings has reached the San Joaquin River. Although, the Lake has recovered in times of extreme runoff, that magic elevation number allowing for overflow never materialized. After 1878, there was much speculation that the Tulare Lake could recover if wet years would materialize, like as 1852 and 1862. But, the final nail in the “The Lake will rise again” theory was the construction of Pine Flat Dam. In 1940 the dam’s construction by the US Army Corp of Engineers was delayed for six years because of controversy between supporters of irrigation development and proponents of flood control. Construction did finally begin in 1947 and was completed in 1954. The dam has obviously increased opportunities for irrigation, better flood control, and crop diversification. The dam also has led to the loss of some of our most extensive wetland habitats in the San Joaquin Valley as well as a depleted aquifer. But alas, some may remember the flooding that resulted in 1983 that brought Tulare Lake to the city limits of Corcoran. The BLM operates a wonderful Tulare Lake restoration site at the Atwell Island Land Retirement Demonstration Project. The following is directly from the Bakersfield Field Office of the BLM Website: Search: Atwell Island Project – Bureau of Land Management. 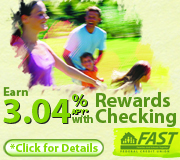 Also visit the Tulare Basin Wildlife Partners on the web. “BLM now owns and manages Atwell Island which consists of 7,000 acres located just south of Alpaugh, Tulare County, and is situated near the Pixley National Wildlife Refuge, Kern National Wildlife Refuge and Allensworth State Historic Park. It is well worth the visit if you are interested in local history or restoration of valley habitat. No reservations are necessary.